Now that I’m 19 weeks pregnant (eek! ), I’ve stopped fitting into most of my old clothes. I have one pair of super stretchy Banana Republic ripped jeans I wear on repeat (photo below), and a few loose dresses that have become my uniform. I knew sooner or later I would have to buy some new clothes or raid Mr. Wonderful’s closet full of free t-shirts (no thanks). This is not exactly an outfit I would recommend, but for the sake of time (and Mr. Wonderful’s patience) I threw them on together for this photo. I know several moms who rave about the Rune Porter leggings so I’ve wanted to try them for myself. Unlike my other leggings from Target and even Splendid, these were a nice, thick fabric, which meant you can’t see through them. Even though I purposely ordered a much larger size than normal (I’m an XXS, these were a S), they still felt tight. An M might have been better for my growing belly. The Papermoon Salvador top reminds me of something you would find at Anthropologie. The front is plain and would look better with a long necklace, but the back detail is beautiful. The straps of my bra were of course visible in the sheer panel, but it didn’t bother me. The quality was not as nice as I expected (the knit fabric is thin and not that soft), making the $58 price tag seem a tad high. I can see how this top would be problematic with people who don’t have skinny arms though – even on mine they felt a bit constricting. With the holidays around the corner, I wanted a fun, flowy top that I could wear to parties. I love sequins in doses, so this seemed like a potential winner. But for whatever reason, it just didn’t excite me. I was surprised at how short it was, even on my small 5’2” frame. I also didn’t like the sheer poly on the sides (hello, bra) and bottom, which seemed to wrinkle easily. My lazy self could never be bothered with steaming it before each wear. This was my favorite piece in the whole box. It’s incredibly comfortable, the fabric is oh-so-soft, and despite it’s fitted shape, I think it would be flattering on many body types. You can see my bump in this dress, which I was surprised to like. I can already think of five different ways to style this dress. Can’t wait to wear it out! Shift dresses are typically not my style (plus orange is one of my least favorite colors), but I was drawn to the unique detailing on this one. It’s another piece I could see at an Anthropologie store, but at $64 (compared to $100-$200 Anthro dresses), it is well priced. How adorable is the bottom trim? I was on the fence over the roominess of the cut, but in the end I decided it would be a comfortable dress to wear as my body changes in the coming months. What are your thoughts on these pieces? Which one’s your favorite? 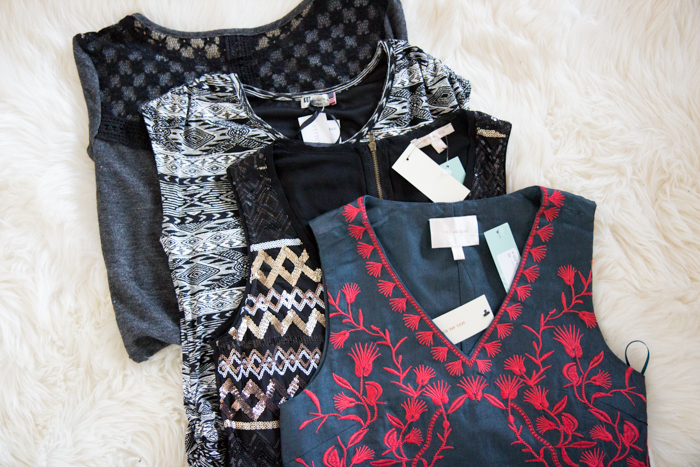 Interested in Stitch Fix? Click my referral form here! Nice fix! I agree that the fitted dress looks great on you! And it will probably still look nice when you are rounder (and again several months after birth). I was surprised to find during my pregnancy that I usually liked the look of fitted items more than loose ones. When you’re feeling really big towards the end, it feels nice to not have your clothing adding even more bulk! One thing I will say about maternity shirts – they need to be a LOT longer than you think. Baggy t-shirts that I only wear to bed stopped covering my bump due to their length long before I thought they would. When I first started wearing the maternity shirts that stores sell, they really felt excessively long, coming down a decent amount past my crotch. Not exactly attractive when I look at some photos I was in back then. But even some of my actual maternity shirts started letting the bottom of my belly hang out in the last month. Many of even my regular shirts were plenty big or stretchy for going outward, but it was the length that really shrunk the options in my wardrobe. This may not happen to you as much, since you are starting off smaller than me, but then again, your shirts are also probably starting off a little smaller than my shirts, lol. One solution to extend the life of your shirts that are not egregiously short (and therefore I think a MUST for your maternity wardrobe) are maternity tank tops (again, much longer than the regular ones and available for cheap at Target, Ross Dress for Less, etc).You can wear them under your clothes to extend the life of your shirts for a lot further into your pregnancy. They could definitely extend the life of some of the shirts you are showing above, as they just make sure the bottom of your bump is not on display. (Also the pants that have elastic that comes up on your belly can have the same effect of covering it up.) The one thing I will say is that I did not like the maternity tank tops at Target that much, as even in the size small, the straps were still really long on their shortest setting (even on someone with a lower chest). But I think there are other brands that could work on more folks – maybe you can find some through your fixes. Anyway, best of luck outfitting your bump – I know you’ll look adorable! Good tip on layering with longer tank tops! I’ll keep that in mind. I know the Papermoon top probably won’t last until the end of my pregnancy, but I figure it’ll be a nice “looser” top to wear post-pregnancy as well so I kept it. Plus I just really liked it. My favorite is the same as yours – the Kut From The Kloth dress! It is super cute on you. My second favorite is the Papermoon Salvador knit top. I agree with Kristen’s comment that maternity shirts need to be pretty long, particularly as your bump grows. I’m 21 weeks with my second baby (so my bump is bigger this time around) and while I really want to keep wearing my usual tops they just don’t cover my rump (which I prefer when wearing leggings). Like Kristen, I also wear tank tops underneath my shirts but for a different reason – they help keep those maternity panels up on my pants or leggings! LOL I wear regular non-maternity tanks from Forever 21 – they have some of the longer ones. This time around I’ve been living in Old Navy leggings (somehow the XS fits me even though I am only 4’11) and tops from Gap. I hope you find maternity clothes you like! Thanks Caitlyn, I’ll have to check out the Old Navy leggings since these ones didn’t work out! I really like the dresses! You are looking really cute pregnant. I love seeing the bump. Another thing to consider, if you are going to breastfeed, is finding clothes that make it easy to nurse, such as v necks, cowl necks or shirts you can lift up for nursing. You will get more traction out of those clothes post pregnancy too.